A new album, a new portrait. 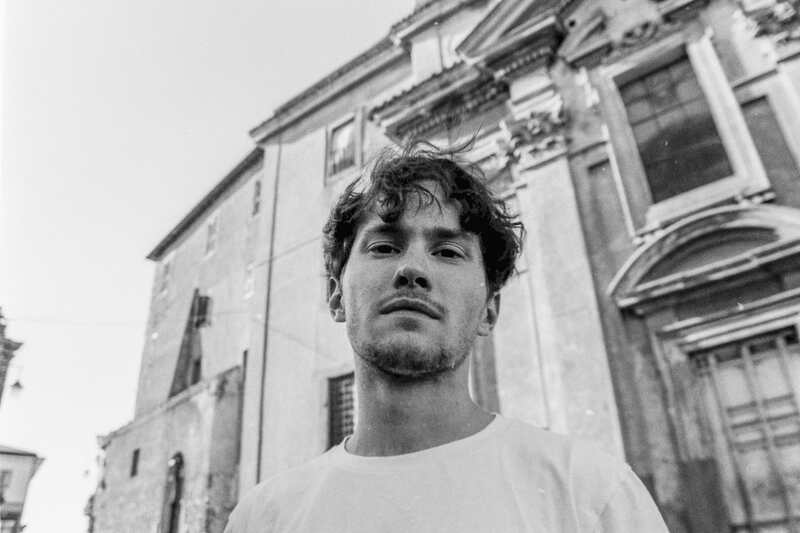 This month marks the release of a new album from David August, a singular producer not content with playing by the rules of genre and stereotypical values. This much is clear from the latest release which is titled "D"Angelo" and features far more thought than your average everyday electronic music album. This is timely and considered, blending influences of neo classical alongside R&B, house, techno and beyond. It is experimental by nature but with a fiercely individual sense of purpose and understanding. David's music has been widely championed by the likes of Dixon, Ame, Ninja Tune, Solomun and more. This is quite something else entirely, perhaps. One part of the inspiration – as for many other titles of the album – is the connection to the Italian culture/greek mythology. In this case, picking up the myth of Narciso – him being blended by his own beauty until he falls into the water that mirrors his face – I tried to connect it to our modern society and it's problem of the fragile ego that so often manifests in too much self love. It's my careful attempt - although being throughout the record with one feet in the past – to mention present issues in our modern and digital world. At the same time this song is the core track of the album, containing probably the most personal informations. The bells in the begging are the sounds of the monastery in front of family home in Italy. I heard them since I can remember, playing every 3 hours during the day. You can hear my mothers voice talking to me in Italian when I was a kid asking me if “i am ready”, choral voices from a sampling session of Palestrina's (my mothers hometown) Choir open up the first part, connecting to my roots but picturing at the same time a suspicious beauty that crashes into darkness, as the myth of Narciso. Particularly for this song, the story-telling is very eclectic. Setting: I was in Berlin when I came up with the idea, but the setting changed a lot as it was the track taking most my time. A part of it also took shape in Palestrina and Florence. In this case I am referring to the two Michelangelos (Buonarroti and Caravaggio) – both artists of two different areas that inspired the whole album. Especially Caravaggio. His painting “Amor vincit omnia” was on one screen and my DAW where the music took place, on the other. An attempt to soundtrack his art in realtime. His painting, aesthetically and meaning wise left quite an impact on me. Although being 400 years old, it's still timeless and so relevant in our present time. Modern art often seeks innovation in abstraction and destruction, mostly being very political. But it's rare to find beauty and a strong message at the same time nowadays. I was reading parts of Dante Alighieri’s "Divine Comedy" during the time I was making the album. It’s like a spiritual path written in chants, where the sound of words sounded like music to me for the first time. It’s very melodic even though there’s no written melody. The lyrics are my attempt at a dialogue with Dante, while also leaving an open space for today. Although not being a religious person, to me this track has a certain transcendence to a time and space unknown. During the entire album it feels to me soundtracking an image of an area – or maybe a subconscious part of my life - I don't really know. Setting: The origins of the song started in Florence. I revisited it many times and finished it in Berlin. It's the only track I left entirely as the first take was. Two years ago, when the album process begun, I spent two weeks in Florence in a beautiful studio a little outside of town in the hills. One night I played on the piano, randomly recording what I was doing. This little excerpt was one part of the session. I manipulated it live with a particular sampler and left it how it was. It pretty much captures a certain feeling of the beginning process. The song, forming a transition to The Life of Merisi – sounds lost and chaotic, not with a certain theme or any repetition. It also ends in uncertainty. At that time I still was searching a lot for the bigger picture the record should have. This clarity came after some time when I was back in Berlin. As the title tells, it's my interpretation of Caravaggio's life. At that point the album needed a statement – an intense, harsh contrast to be put as a center piece. Although having delivered all the incredible art, Caravaggio was a tortured artist living in fear until his death. I tried to put all the violence he lived, and pictured in his paintings, into a sonic landscape. His obsession with truth – as how things should be shown and told – was terrifying and probably the reason he became this famous. Whereas most of the artist were showing all these holy motives in a supernatural way – like the church wanted them to see -, he brought the characters and the surroundings into his present time. Showing them in a realistic way. This said, the lyrics of the track, are the most meaningful to me. The ending was uncertain for a while as – choosing such a track name – you literally have to tell it until the very end, right? I tried to go into a weird ecstasy, with a surreal saxophone screaming into harmony, but yet leaving a vague feeling. Setting: Berlin, Palestrina and Florence. It's the continuation of his predecessor. In a romantic and naive way, it's where I placed the painter mentioned before. I felt the whole album was somewhere heavy and intense. Not sonically, but especially in personal way. I didn't want the listener to have this heavy feeling in the end, but rather some lightness. As no matter how personal and how many messages you want to leave, music should be something to enjoy I think. The track is hopeful to me, yet fades away and leaves the road open to any directions that would come in future.